Many historical artifacts exist on the trail today from way back when Powell River was a booming logging town. There’s everything from the old Steam Donkey to the Sidewinder, and plenty of other interesting logging machines. 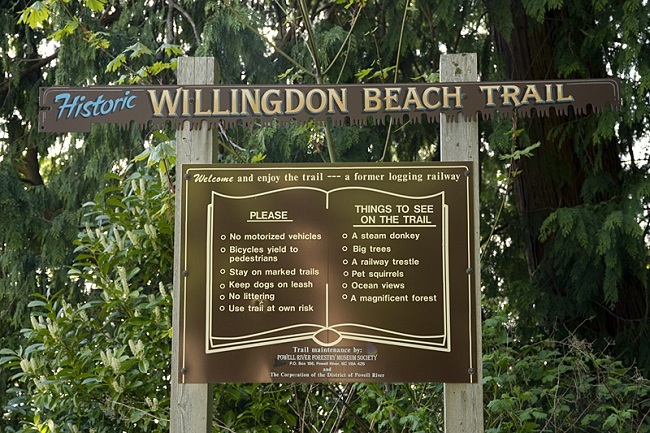 Much like the Sea-Walk, the Willingdon Beach Trail is a great place to go for a leisurely stroll with a friend and socialize a bit. Before you walk across the Second Beach Trestle around the halfway point on the walk, be sure to look underneath. t’s built in a style reminiscent of what the trail used to be…a railroad. Trains used to run along here carrying logs all the way to the mill to be processed for the old Powell River Company. From the Powell River Visitor Info Centre, head north on Joyce Avenue toward Alberni Street. Turn left onto Alberni Street and take a slight right onto Marine Ave. Park your vehicle and head to the northern-most end of the campsite.